If you want to get a free copy of your FamilySearch family tree to upload to another program or website (Ancestry, MyHeritage, etc) you’ll need to use one of FamilySearch’s partner programs to get this data. Each of these partners, Ancestral Quest, Legacy Family Tree, and RootsMagic has a free version you can use to export a FamilySearch family tree and create a GEDCOM file, a format universally used for sharing family tree files. First, you’ll need to download a free version of RootsMagic. At rootsmagic.com and in the header menu, select Downloads, then select Trial Versions. Next to RootsMagic 7, select Try Now; you’ll be taken to a Try RootsMagic page where you’ll need to type in your First Name, Last Name, email address, and verify your email address, then select Download. You’ll be prompted to either download the RootsMagic Essentials 7.5.9.0 Installer for Windows or the RootsMagic 7 for Mac Installer. Select the appropriate download for your Windows or Mac computer. Go to your Downloads folder on your computer and open and install RootsMagic to your computer. 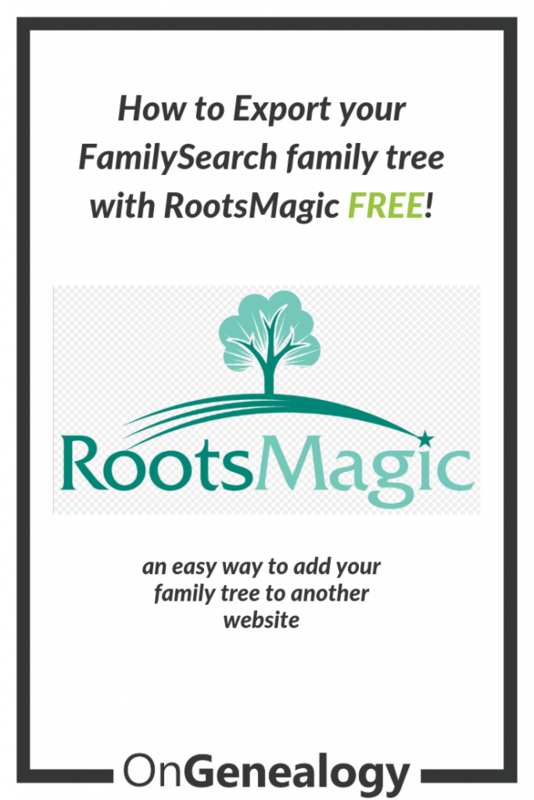 How to Export a FamilySearch GEDCOM with RootsMagic. You may get warnings like “FamilySearch is not responding to your request, Read timed out.” You can hit OK to get rid of the warning The import is working if you continue to see the People and Families count increasing. Just let the system keep running. When the tree is finished importing, you’ll hit Close. RootsMagic will automatically close when the backup is complete. Now you have a GEDCOM file with your FamilySearch family tree in your computer files. The GEDCOM file ends with .ged, the RootsMagic tree file ends with .rmgc. You can upload this GEDCOM file to any other family tree program or genealogy site that allows GEDCOM files, which is most of them. It’s the standard file type for family trees. Here’ a pinnable image to save for future reference. You can follow the OnGenealogy Pinterest boards for more tips from other genealogy bloggers and companies!